I am not the world’s biggest Prince fan. I was the ‘right’ age (early 20’s) when Prince released the movie Purple Rain and then his album 1999. And being from Minnesota, this shining musical star from my home state was big news and very exciting. But his later music didn’t appeal to me as much. I think this is a reflection more on me and my being ‘stuck’ in a style and genre while Prince explored the music scene. But whether or not I am a Prince fan isn’t really important. I recognize the nature of what he did and the value and genius behind his work. This book is a collection of essays and articles written by Jim Walsh who covered the music scene for the St. Paul Pioneer Press through the 1990’s. Walsh clearly developed a fondness for Prince and, through his honesty and appreciation for the artist, developed a personal relationship with the Minnesota musician. While this did allow Walsh a little more insight and direct access for the occasional interview, Walsh manages to be honest with Prince and his own readers. One of the more interesting portions comes near the end of the book when Walsh writes an ‘open letter’ to Prince asking for a birthday present … a great record. The letter doesn’t hold back on recent disappointments and the desire for Prince to get back to doing what he does best. And as interesting as the article is, Walsh’s follow-up (which was not something printed in the newspaper) is even more-so. Walsh is summoned to Paisley Park (Prince’s home) and the two have a discussion about the article, its impact on young readers and so forth. This was really fascinating because it showed not only Walsh’s appreciation for Prince, but Prince’s respect for Walsh and what he did as a writer to promote Prince and other music. I’m not a deep Prince fan, but I do have a greater appreciation for him, and his music, thanks to this collection. Looking for a good book? 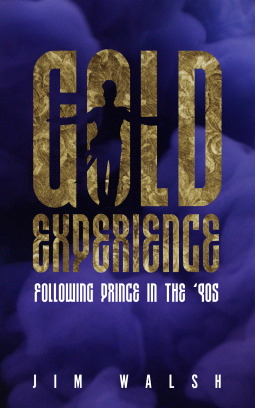 Gold Experience is a collection of essay by Jim Walsh, written about the artist Prince and it is wonderful reading for Prince fans and for those who like solid non-fiction writing and who appreciate the music scene.